I am delighted to give you an update on our achievements. We are four months into our new year and can happily report continued growth in our mission and our group. We have added the following hospitals to our growing list: Michael Debakey V. A., Katy Memorial Hermann, Spring Branch Medical Center, Shriners and Texas Childrens hospitals. 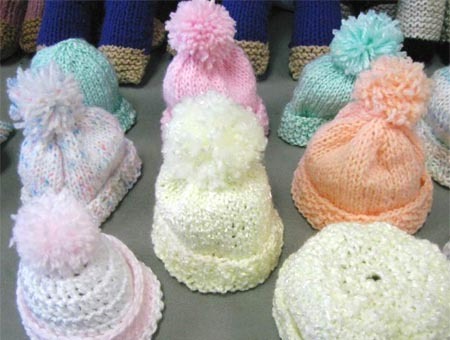 We donate almost 1,000 handcrafted fabricworks each month. We meet six times a month, and many of our Members sew, cut, quilt, knit and crochet at home. We feel great about what we do, and we hear regularly from patients and hospitals that our efforts are both appreciated and helpful. Check out this report from Jennifer Barnes at the Harris County Hospital System. Once we receive your donation we divide up the items according to the areas/units listed below for both Ben Taub and LBJ. Those items that are set aside for LBJ are delivered within two days by our District Transportation team who deliver to Rich Arenschieldt, my coordinator at LBJ. He then delivers to the units as listed below. The Nurse Managers take receipt of the items and distribute to the patients either before or after their procedures as is appropriate. The patients just light up when they receive these gifts and it makes their day! It makes our day too! Thank you for you gift of love. Come when you can. You are the best part of my week. Many thanks to Lenore, Marilyn and Charles for enabling us to meet on August 31. We have lots of fabricworks ready to donate in the upcoming week. Our recent donations have gone to M.D. 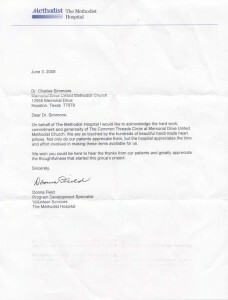 Anderson, Shriners, Children’s Memorial Hermann, Ben Taub, Texas Children’s, Methodist and Memorial Hermann Hospitals. Good work team! Bring friends and family to help stuff pillows! I look forward to seeing all of you. Even though I was enjoying a most excellent visit with a grandchild between bites of fab chocolate, I still missed you and our shared mission to help out in Houston hospitals. When you have a vision of what is the right thing to do, and someone else sees it, that makes you appreciate them all the more. Donna Field, you’re the greatest! 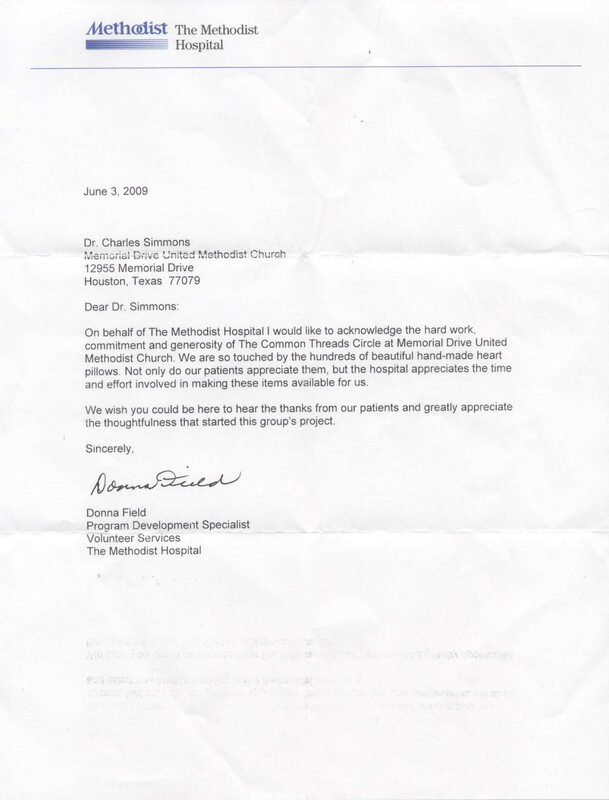 On behalf of The Methodist Hospital I would like to acknowledge the hard work, commitment and generosity of The Common Thread Circle at Memorial Drive United Methodist Church. 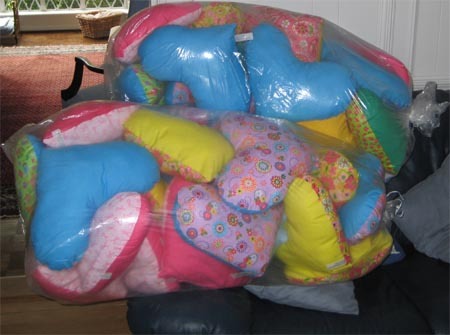 We are so touched by the hundreds of beautiful hand-made heart pillows. Not only do our patients appreciate them, but the hospital appreciates the time and effort involved in making these items available for us. We wish you could be here to hear the thanks from our patients and greatly appreciate the thoughtfulness that started this group’s project. We have a vision here at The Common Thread Circle: each patient facing a hospital stay gets a custom fabric work so they have something to hold, to comfort them and keep them warm, that will help them face what’s ahead with bravery, dignity and hope. We thank all who share this vision. You are currently browsing the The Common Thread Circle blog archives for September, 2009.